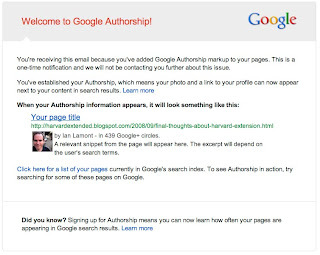 The Digital Media Machine: What is Google Authorship? This morning, I received a notification that I had joined Google Authorship (see screenshot, below). I had never heard of this service and assumed it had something to do with the three books I have authored, including one (an unofficial manual for Excel and other spreadsheet programs) that was published just last night. I don't know what "Google Authorship markup" is, but suspect it's related to my heavy blogging activity over the years (including recent product sites based on Google Blogger, such as Dropbox In 30 Minutes and Google Drive And Docs In 30 Minutes) as well as the fact that I've circulated some recent posts and product pages on Google Plus. Indeed, clicking through to the "search results" link at the bottom of the Authorship notice, I'm taken to fourteen SERPs of mostly blogs, Google Plus entries, and some YouTube videos I've created over the years. The list is not complete -- I've written more than 1,000 pieces of indexed content if Computerworld and non-Google blogs are included. But the Google Authorship collection online has a limited selection of posts that are tied to my main Google account.